DDB, Grey take gold for the U.S.
CANNES, France—A colorful gay pride campaign from Australia that turned ATMs into GAYTMs earned Whybin\TBWA the Grand Prix in the Outdoor Lions contest here tonight. The campaign, done for ANZ Bank's sponsorship of this year's Sydney Gay and Lesbian Mardi Gras, involved bejeweling each unique GAYTM by hand in rhinestones, sequins, studs, leather, denim and fur, "turning the day-to-day activity of withdrawing money into a fabulous experience," the agency said in its release at the time. "From unicorns and drag queens to rainbows and tattoos, each GAYTM is a riot of color and textures to celebrate the festival and show ANZ's support for diversity," the agency added. 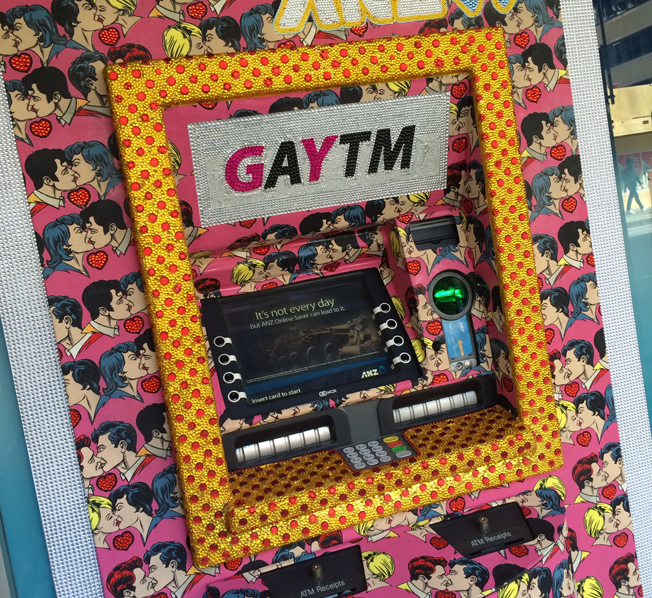 The GAYTM screens were also given a makeover to show messages and well-wishes such as "Hello gorgeous" and "Cash out and proud." They also dispensed rainbow colored receipts. ANZ also donated the ATM operator fees for non-ANZ cardholders from the GAYTMs to nonprofit organization Twenty10 for the duration of the campaign. OgilvyOne's #LookUp billboards for British Airways, which won the Grand Prix in Direct on Monday and was considered a favorite in Outdoor too, won a gold Lion. U.S. agencies were led by New York's DDB and Grey, each of which won gold. DDB won for WaterIsLife's Drinkable Book, which we wrote about here. Grey won for turning a Manhattan gas station into a Ewing Energies station for the TNT reboot of Dallas. The TBWA network—which won a Grand Prix in Press last year for TBWA\Media Arts Lab's Apple print ads—added another Lion in the Outdoor category this year: a bronze for TBWA\Chiat\Day's delivery of a Nissan vehicle in a giant Amazon.com box.